It’s one of the more rehashed questions plaguing the deepest depths of Fantasy Twitter. The 2014 seventh round pick of the Green Bay Packers is the absolute darling of those who place a premium on size, athletic testing and college production to evaluate draft prospects. Yet, we rarely got to see him with the Packers offense, despite a clear need for a playmaker this season. That was, until the Divisional Round of the playoffs. In the biggest game of Green Bay’s season, Janis finally got on the field after injuries to Randall Cobb and Davante Adams forced the team’s hand. All he did was explode for seven catches for 145 yards and two touchdowns, including the game-tier to force overtime. It was truly something special to watch, and the subsequent internet explosion was quite fun. The long-faithful Janis truthers reveled in the moment, as they should, declaring some level of vindication at every turn. Again, this was their moment, and no one encourages cheering for the players you stand up so strongly for more than me. However, we still are no closer to the answer for the original question than we were the morning of January 16th. I believe the only true way to understand the quality of a wide receiver, as best we can, is to study how they perform on a route-to-route basis. It’s why I created Reception Perception, and why it is an effective methodology. The rest is noise to me, and part of good process is trying to shut it out. In order to effectively judge that route-to-route performance, you need to have an effective sample size. It’s why, through many tests and trials, I set strict limits at a 300 snap minimum over a season to get considered for the required eight game sample for a season-scope Reception Perception study, and I won’t chart games under 20 snaps. Jeff Janis does not qualify for a season-scope and has just three career games with at least 20 snaps, including his most recent one. Yet, I’m curious, as I always was with the Janis situation, and the public is clearly hungry for the information. For that reason, I decided to take a look at Jeff Janis’ performance against the Arizona Cardinals in the playoffs through the Reception Perception lens. Since I believe in the sample size requirements, we won’t come away with any set in stone convictions about his future. The hope is that Reception Perception adds a layer of context, and at least lets us know where we truly stand at this moment in time with Jeff Janis. No position is more dependent on external factors for production than the wide receiver, and it goes well beyond just the quarterback delivering them the football. Opportunity is earned, or forced, and that is just the first step. For Jeff Janis, opportunity came by way of attrition, but when it finally came, it arrived in bunches. ​The rumors out of Green Bay long held that Janis did not earn playing time because Aaron Rodgers, the coaching staff and even the concession stand attendees did not trust him to be in the right place at the proper time on passing plays. Well on that fateful Saturday, they all had to let that go. 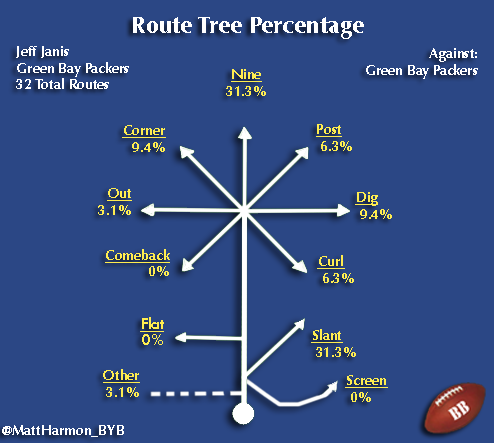 Janis ran 32 routes, and Rodgers targeted him on a whopping 37.5 percent of them. It was the clear highest rate on the team. To Janis’ credit, despite many of the targets being of a high degree of difficulty, he posted respectable efficiency. He hauled in a catch on 21.9 percent of his routes, and never dropped a pass. Drops are hands down the most overrated wide receiver evaluation number thrown around, but given the outline of Janis’ path to little playing time, it was important that he did not commit a gaffe on this big stage. The common critiques or “slow your roll” comments in response to Janis’ moment have to do with him being just a go-route runner. If there is one thing to take away from this incredibly brief Reception Perception look: remember that is not worth as much as what some want you to think it is. ​Naturally, Jeff Janis ran plenty of nine-routes in this contest. He checks in with 31.3 percent of his 32 routes as just straight-line vertical plays. No one should be surprised. Not only is his speed his best asset, but the Packers spent much of the fourth quarter in desperation mode to mount the comeback. Just don’t overlook the rest of the chart. Janis checks in with an identical 31.3 percent of his routes as slants, as well. When studying a deep threat, people tend to overrate the fact that they don’t run enough of the route tree. If you are a high-end speedster, I’m really only interested in whether you can rip back on the curl route or show just enough subtlety to run away from coverage on slants consistently. Mike Wallace made a living in Pittsburgh doing that. The Packers at least sprinkled some other routes into Jeff Janis’ assignments for this game. We should certainly be encouraged that he tried his hand at a variety of patterns, especially considering how he performed on them. Let’s start with the vertical plays again. Janis posted a 60 percent SRVC score on nine routes, which clocks in several percentage points over the league average from the 2014 season. There is no question he adds a dimension in the deep portion of the game, curiously the one place Green Bay needed the most help. Janis also hauled in one of his two contested catch attempts against Arizona, showing some ability to play through contact in traffic. He accumulated most of his production here, with 18.1 PTS on nine-route plays. 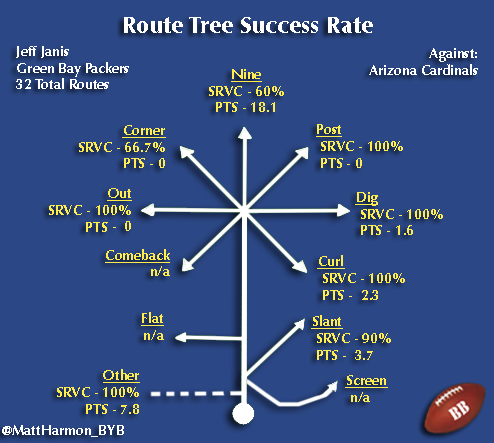 Looking at the other route the Packers asked Janis to run with high frequency, Janis came through with a stellar 90 percent SRVC. For this one game, he passed the test of what you like to see out of deep threat in order to have them play a role beyond just a decoy and occasional shot play asset. Elsewhere, Janis posted stellar scores on all his other routes. Of course, he did not run them with near the frequency as the slant and the nine, but he completely showed out. We don’t know if he has that route-to-route consistency is in his game as full-time player, but he gave more than enough reason to be optimistic. Janis also scored 7.8 PTS on an “other” route, which was an improvisational pattern in the end zone. Aaron Rodgers looking to him, and Janis breaking off a traditional route to find the crack for a touchdown was rather huge considering the trust factor previously mentioned. No matter the coverage, Jeff Janis passed his opening test. The scores were simply wild. Again, please continue applying the caveat of “just one game” but as Reception Perception does best, Janis’ SRVC numbers cement the level of quality with which he played. The most important score is the 81.3 percent SRVC against 16 press attempts. Janis showed a surprisingly strong release move. You don’t get vertical on athleticism alone. A receiver must first find a way to detangle from the opposing cornerback’s jam at the line. Of all the discoveries from this game, Janis’ performance against press coverage was by far the least expected, but most encouraging. His moves were a little clunky, but what matters is they were effective against NFL cornerbacks, and that is nothing but a fantastic start. So, with all the data we just inhaled, back to the original question: is Jeff Janis good? As stated from the start, we still cannot say for sure. What we can declare with certainty after taking in his Reception Perception, is that that Packers made a big mistake in not playing Janis sooner. It was apparent to any objective observer that this stagnant offense needed a spark, and someone to provide a playmaking element in the vertical game. The answer, at least to some degree, was right under their nose the whole time, and it wears a No. 83 jersey. His Reception Perception shows he clearly holds the skills to help them, even if just in flashes, and yet there was hardly ever an inclination to try. Given what we know now, it seems quite odd. Who knows whether Jeff Janis ever sustains anything even close to the performance laid out here on a constant route-to-route basis over a full compliment of opportunities. However, not all receivers need to do that to find a place in the league. Demaryius Thomas is the highest of high-end range of outcomes for a wide receiver who is a sub-par route runner, but carries enough trump cards to make that negligible. Not many players find their way into that breath, even if they hold some comparable measurables. Nevertheless, we mentioned Mike Wallace earlier as a lesser member in this vein, and you could even lump a player like Ted Ginn in there too. Based on this minuscule Reception Perception look at one game, I think it’s foolish to write off Jeff Janis as a mere flash in the pan. He brought it on a route-to-route basis, performed multiple layers of assignments and showed himself as an asset. Far be it from me to tell you not to entertain the range of outcomes for Janis at this point, because that would be irresponsible and it is not my style in the slightest. As Josh Norris brought to light for us, proper evaluation of a player and the subsequent deployment is all about finding “where they win”. There’s little use in hammering what a player cannot do, in your opinion, when they clearly have an asset to bring to the equation. The trump card theory in actualized form. Jeff Janis proved in this game that he can qualify, at least to some level. Lets just hope we get a chance to see it a little more often.